I love juicy ripe plums eaten out of hand but seldom bake with them. This is one of the only recipes I bake using blue plums; these are those oval plums, sometimes called prune or Stanley plums that are only available for a few weeks in the early fall. They are inexpensive, not too sweet and they get soft and purpley delish in this simple tart. It is modeled after a German fruit tart I had enjoyed in my wheat loving past life. I think my version replicates it quite well although mine is a tad more cakey….not a bad thing either! I posted this last year but wanted to share it again. This time I found smaller Stanley plums and tried them instead of the big ones used last year. They were great so you can definitely go with either size of oval plum. I think you could make it with round plums but I do think the oval ones have more flavor and are more suited to baking than round purple plums. I use my favorite homemade cobbler mix which makes this really simple. I will put the mix recipe down at the end of this post. I keep it in my freezer and one cup makes great cobbler or works as this tart base. A few instructions to assist you if you make this tart: I cut up the plums first and sprinkle them with sugar, let them stand while I mix the dry stuff up and then stir up the wet items in a small mixing bowl. If you want it lower in sugar just leave off that sprinkle here; it will still taste great. Be sure to use a 10 inch tart pan; if you made the tart in a 9 inch one it may well spill over and burn on the bottom of your oven which is never a good thing. You could also use a 9-10 inch pie pan as a baking dish. We like it with a small scoop of vanilla ice cream on the side. It is fine unadorned. Makes a great breakfast too with a cup of coffee or tea. 1 ½ lbs prune plums (enough to cover the entire tart pan) cut in halves or quarters. I used 9 large ones for this most recent tart. Heat oven to 350 degrees. Mix two dry ingredients in a small bowl. Spray a 10 in deep tart pan with cooking spray, could use a 9-10 inch pie pan as a substitute baking dish. Beat eggs in medium bowl, add rest of wet ingredients, mix well, add to dry ingredients, stir the batter briefly to fully blend. Pour into the prepared pan and spread it out with a flexible spatula. It often just spread great if you tilt the pan a bit – the batter will spread all on its own. Top with plums, cut side up, push each in slightly into the batter and cover the entire surface of tart base. Sometimes I cut up a few plums and fit the chunks in around the halves but this time I didn’t; works either way. Bake 3-5 more minutes or until top looks done. Re-posted from my blog, originally October 2014, minor changes to text and cooking time in recipe. There is a huge abundance of fruit in September. Still some peaches, plums, grapes and nectarines while apples and pears are pouring in. What to bake? Tough decision, I decided to go with something I rarely use: we love juicy ripe plums but I seldom bake with them. 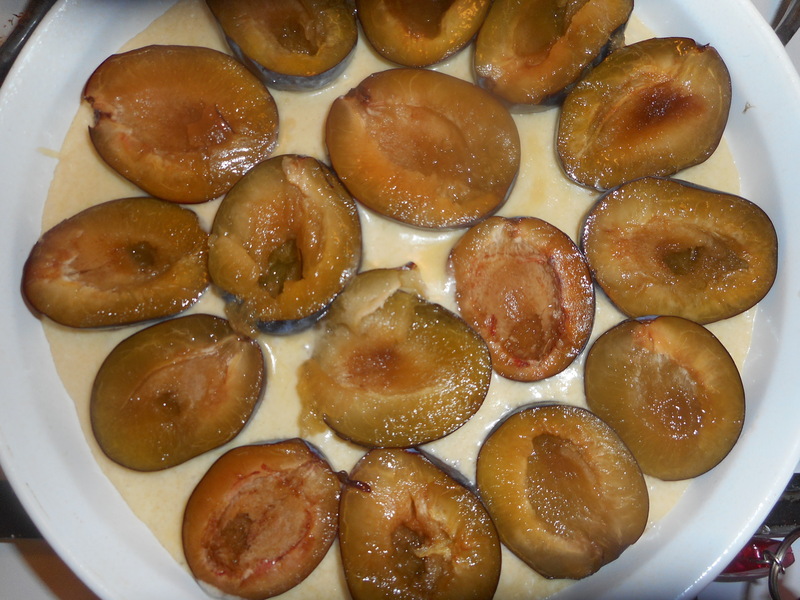 This is one of the only recipes I can make gluten free with blue plums; these are those oval plums, sometimes called prune or Stanley plums that are only available for a few weeks in the early fall. They are inexpensive, not too sweet and they get soft and purply delish in this simple tart. It is modeled closely after German plum tarts I had enjoyed in my wheat loving past life. I think it replicates them quite well. I posted this last year (2014) but wanted to share it again. 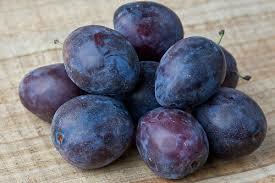 This time I found really huge Stanley plums and tried them instead of the small ones I have always used in the past. They were great so you can definitely go with either size of oval plum. I think you could make it with round plums but I do think the oval ones have more flavor and are more suited to baking than round eating plums. I use my favorite cobbler mix which makes this really simple. I will put the mix recipe down at the end of this post. It was created by Bette Hagman. I keep it in my freezer and one cup is the dry ingredients for a great cobbler or for this tart. To this particular batch I added a couple teaspoons of dried lemon peel powder. This ingredient is made of lemon peels rolled in sugar and dried, leftover after make homemade lemoncello liquor. They become powder after a few moments in my spice blender. The fine powder adds a subtle lemon flavor but its okay; you don’t absolutely need it to make this recipe work. It is in the original recipe but I never bothered before to make some even though I had the dried lemon peels. The addition is great and if you can add it you won’t be disappointed. Be sure to use a 10 inch tart pan; if you made the tart in a 9 inch one it may well spill over and burn on the bottom of your oven which is never a good thing. We like it with a small scoop of vanilla ice cream on the side. It is fine all on its own. Makes a great breakfast too with a cup of coffee or tea. This is the tart I made Sept. 2014 in a 9 inch tart pan; very very full! This tart was made in September 2015 with big fat Stanley plums: just before putting in the oven. Made in a a ten inch ceramic tart pan. 1 ½ lbs prune plums (enough to cover the entire tart pan) pitted and cut in half. Heat oven to 350 degrees. Mix dry ingredients in a small bowl. Cut up plums; be sure to get all the pit; sometimes a small bit of it can be left up near the pointy end where the plum attached to the branch. I like to cut them in half along the crease; get a nice pair of plum halves that way. Sprinkle with the sugar and let them sit while you make the batter. Beat eggs in bowl, add rest of wet ingredients, mix well, add to dry ingredients, stir the batter briefly to fully blend. Pour into the prepared pan and spread it out with a spatula. It often just spread great if you tilt the pan a bit – the batter will spread all on its own. 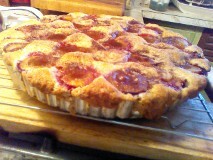 Top with plums, cut side up, push each in slightly into the batter and cover the entire surface of tart base. Sometimes I cut up a few plums and fit the chunks in around the halves but this time I didn’t; works either way. Bake 4- 10 more minutes or until top looks done. Autumn Plum Tart, Perfectly Tasty! There is a huge abundance of fruit in August and September. Still lots of peaches, plums, grapes and nectarines and the early apples and pears are coming in. What to bake? Tough decision, still I love juicy ripe plums but seldom bake with them. This is one of the only recipes I can make gluten free with blue plums; these are those oval small plums, sometimes called prune or Stanley plums that are only available for a few weeks in the early fall. They are inexpensive, not too sweet and they get soft and purply delish in this simple tart. It is modeled after some German fruit tarts I had enjoyed in my wheat loving past life. I think it replicates them quite well. You will use my favorite cobbler mix as the crust base, which makes this recipe really simple. I will put the mix recipe down at the end of this post. I keep it in my freezer and one cup makes great cobbler or this tart base. To this particular batch I added a couple teaspoons of dried lemon peel powder. This ingredient is made of lemon peels rolled in sugar and dried, leftover after make homemade lemoncello liquor. They become powder after a few moments in my spice blender. The fine powder adds a subtle lemon flavor but its okay, you don’t absolutely need it to make this recipe work. It is in the original recipe but I never bothered before to make some even though I had the dried lemon peels. The addition is great and if you can add it you won’t be disappointed. A few instructions to assist you if you make this tart: I cut up the plums first and sprinkle them with sugar, let them stand while I mix the dry stuff up and then stir up the wet items in a small mixing bowl. Be sure to use a 10 inch tart pan; it can be made in a 9 inch one but it may well spill over and burn on the bottom of your oven which is never a good thing. Beat eggs in bowl, add rest of wet ingredients, mix well, add to dry ingredients, stir briefly just to mix up. Pour into the prepared pan and spread it out with a spatula. Top with plums, cut side up, push each in slightly into the batter and cover the entire surface of tart base. Bake ten more minutes or until top looks done.